VBA allows one to work with hyperlinks in many ways. You can add hyperlinks, remove hyperlinks, create emails using hyperlinks, and open files using hyperlinks in VBA. 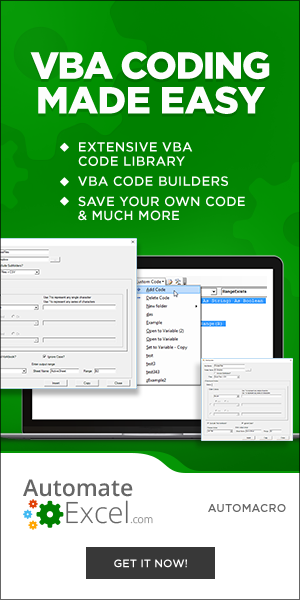 This VBA Tutorial covers the different ways to work with hyperlinks in VBA. The Hyperlinks.Add Method can add a hyperlink to a cell using VBA. This is what you could do instead of typing it directly into your cell. You can add neat user-friendly text to display to your hyperlink, with VBA. If you used the worksheet functionality you would insert a hyperlink and then add a text to display in the dialog box provided. ActiveSheet.Hyperlinks.Add Range("A1"), Address:="https://www.automateexcel.com/", TextToDisplay:="Automate Excel"
You can add a ScreenTip to your hyperlink that the viewer will see when they hover over the link. 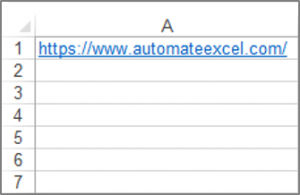 ActiveSheet.Hyperlinks.Add Range("A1"), Address:="https://www.automateexcel.com/", TextToDisplay:="Automate Excel", ScreenTip:="This is the link for Automate Excel"
The Hyperlinks.Delete Method can be used to delete a hyperlink from a cell. The following code will delete the hyperlink from cell A1 and the text in the cell. Note that just deleting the hyperlink, does not delete the text itself that’s why if you want the text deleted you also have to use the Clear method. You can also delete all the hyperlinks in your worksheet using the Hyperlinks.Delete method. You can add a hyperlink to a cell in one sheet that takes you to another sheet, in the same workbook with VBA. Let’s say you are on Sheet1, cell A1 of your workbook and you want to insert a hyperlink to Sheet2, cell B2 of the same workbook, you can use the SubAddress property to do this. ActiveSheet.Hyperlinks.Add Range("A1"), Address:="", SubAddress:="'" &amp; Sheet2.Name &amp; "'!B2", TextToDisplay:="Click Here to Go to Sheet2, cell B2 of the same workbook"
You can access the hyperlinks collection and display all the hyperlinks in your worksheet in the Intermediate window in the VBA Editor. You must first press CTRL-G on your keyboard or go to View>Intermediate Window in the VBE Editor, to view the Intermediate Window. The results are shown in the Intermediate Window. You can access the hyperlinks collection and display all the hyperlinks in your workbook using a Message Box. You can read more about For Loops in this tutorial on our site. You can also create emails using the FollowHyperlink Method. msgLink = "mailto:" &amp; "person@email.com" &amp; "?" &amp; "subject=" &amp; "Hello" &amp; "&amp;" &amp; "body=" &amp; "How are you?" 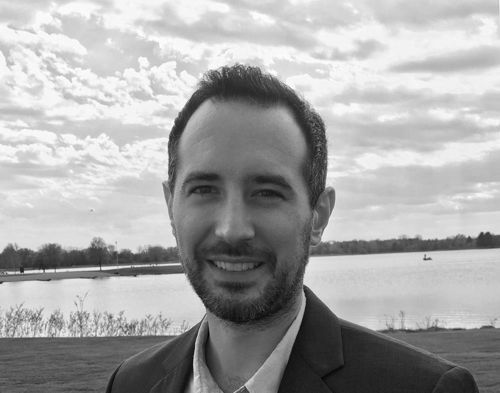 You can add a hyperlink to an Autoshape in Excel so that when the user clicks on the shape they get taken to a website address. Let’s say you have a post title in cell A4 and a post link in cell B4 as shown in the image below. link_location – This is the link to the document, file, place in the workbook or online site. friendly_name – (Optional) – The text or numeric value that is displayed in the cell. VBA allows you to work with hyperlinks in Access too. Let’s say we have a button on a form and when the user clicks on that button we want them to be taken to a website. One way that you can use to do this, is through the Application.FollowHyperlink method. We have our sample form with a button called buttonOne shown below. You can work with hyperlinks in VBA in Word too. 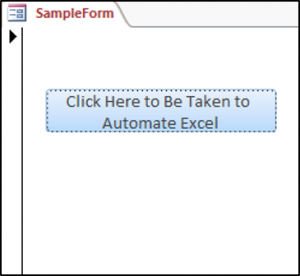 Let’s say we have text in Word that says Click Here to Be Taken to the Automate Excel Website, that is selected as shown below.